Con motivo del Festival Mextrópoli, Arquine coordinó la venta de libros de editorales invitadas para promover publicaciones de los conferencistas. AMO/OMA guest edit an issue of Domus, looking at four recent buildings not through our eyes but through the broader media and cultural context which these projects entered into, and through the intimate and critical experiences of their users. “With this issue we try to (re)present four recent buildings in a fresh, complex way. We don’t insist on the buildings’ qualities, but monitored their effects on their respective hosts and users. There are no “critics” – usually, best friends in drag – no intimidation. We have assembled myriad anonymous voices and collected snapshots. We documented how (our) buildings take their place in a primordial sea of influences and predecessors on which their existence depends and to whose existence they try to contribue. We looked through the eyes of tourists and artists, trusted others to record. 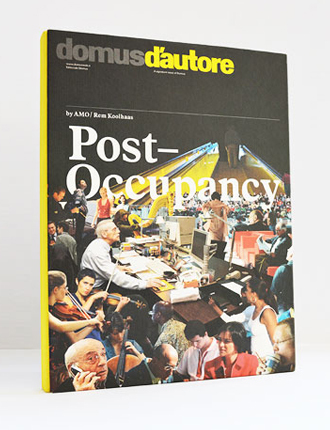 Away from the triumphalist or miserablist glare of the media, we wanted to see what happens in the absence of the author, to represent the realities we were complicit in creating, post-occupancy, as facts, not feats.” – Rem Koolhaas.